Similar to the way that Supercop is technically Police Story 3, The Legend of Drunken Master is also known as Drunken Master 2 but as fans of Jackie Chan understand very well, the plots and sequels are interchangeable and inconsequential since all we really want to see is the highly choreographed action sequences completed by the brave, talented man who does all of his own stunts. 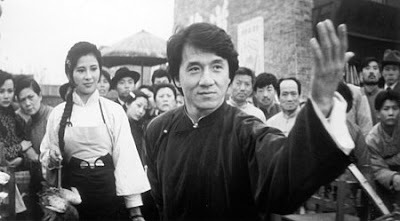 As he's often pointed out in interviews and/or is often referenced critically-- the films of Jackie Chan and his very persona seem to be indicative of an unlikely lineage of physical comedy, slapstick, and dancer like precision that you can trace back regardless of the genre or country to the boom of silent film stars Buster Keaton and Charlie Chaplin. Those individuals are two of Jackie Chan's idols and indeed Chaplin is even referenced in Shanghai Knights (itself a sequel of Shanghai Noon) in one of his lackluster but successful comedy hybrids that pairs Chan up with highly verbal American costars like Shanghai's Owen Wilson and Rush Hour's Chris Tucker to be the yin to his yang. 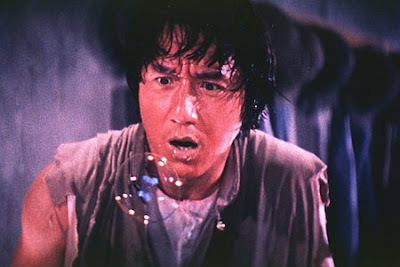 Yet, in a Jackie Chan movie, everything including the props are merely a sidekick since you never know when he'll swing a costar or a lamp, run up a wall or jump on a helicopter risking life and limb to entertain us with his own unique Jackie Chan character. The bottom line is, after breakneck schedules and dozens upon dozens of movies, Chan has become one of those immediately identifiable and lovable character types in the tradition of not just Chaplin and Keaton but The Marx Brothers (Harpo especially), Fred Astaire, Gene Kelly, Lucille Ball, Jacques Tati, Peter Sellers, and Woody Allen whom you're instantly familiar with as soon as he hits the screen. 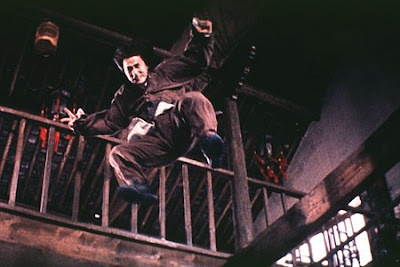 And although that may have limited him in terms of expanding past his niche, he seems quite content to stay precisely in it by resisting offers to take on films that he's described as in the Dragon Dynasty Supercop interview aren't quintessentially “Jackie Chan movies,” like Zhang Yimou's Hero (one of the other titles in this Ultimate Force of Four Blu-ray set). Yet despite the disappointing quality of a majority of his American titles after he crossed over with Rumble in the Bronx, there's absolutely nobody who can touch him in his given realm. 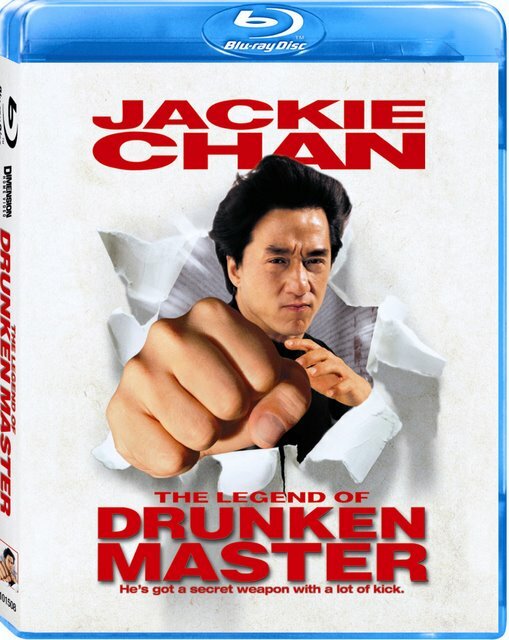 Widely considered one of his top five movies, although due to the fact that he was forty and far too old to reprise the role made some purists prefer the original, 1994's The Legend of Drunken Master took six years to make its way officially across the pond. 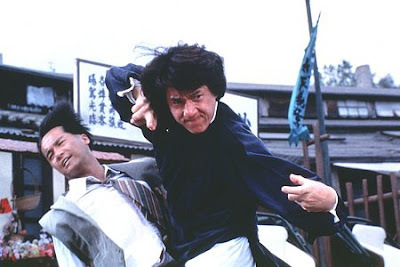 Of course, due to the overwhelming amount of Jackie Chan and martial arts movie bootlegs, most of us had already seen the film and have lamented that its unparalleled humor and innovative action sequences have started to become watered down over the years in lukewarm films so bad that I've actually fallen asleep in more than a few. While overall I still think Supercop is his more successful work from a storytelling point of view since this one basically consists of a thrown together plot a bunch of people may have shouted out in a game of charades involving greedy British government workers who stole artifacts, this is still hands down, the best cinematic proof of Chan's incredible skill as a performer and innovative fighter. 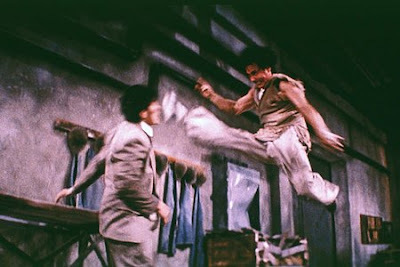 Although, much like the plot, the humor is laid on way too thick as the concept involves the folkloric fighting style belief that Chan's character becomes more powerful when he drinks liquor by the case which-- aside from some amazing sight gags as Chan swings to and fro like a tree in the wind without falling over-- grows fairly old. Possibly best presented as a silent movie or with the original language track intact and subtitles, the film unfortunately borders on the obnoxious due to the nails-on-a-blackboard English language dub that takes away from the movie's sheer power to astound with sequences that have yet to be matched and amazingly didn't involve phony tactics, doubles, or computer effects. Despite a few unpleasant sight gags involving the bodily after-effects of drunkenness, the best source of consistent humor in the film is via its biggest scene-stealer in the form of the late great Anita Mui often called the "Madonna of Asia." 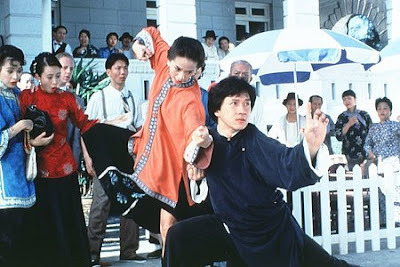 In the film, Mui portrays Chan's stepmother to whom he's fiercely devoted, making the comedy much more effective due to its unique twist to give a woman in the male-dominated martial arts picture such a memorable role. Still, admittedly I'm one of the select few who never quite got as an immense kick out of the odd but legendary hybrid of drunken boxing as others including Chan whose argument that it was comedy gold with the director resulted in the helmer walking out. And while I still don't love the drunken boxing set-up, in the end Chan manages to go beyond-- as he notes-- a far more difficult challenge than other roles since he had to move wildly yet still hit marks and by taking the reigns for a showstopping final fight he leads you gasping for air as though you dove drunkenly into hot coals along with him. 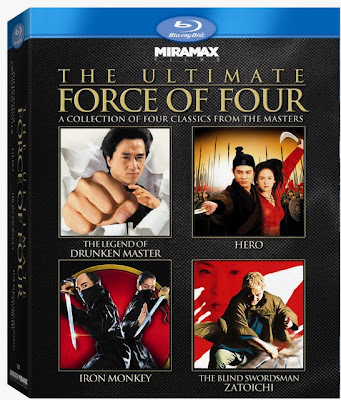 Filled with intense hand-to-hand combat and constant slapstick fights, the film speeds mightily along and is at its smoothest when the plot is cast aside and we can just watch Chan take on enough foes to fill his whole village while chugging three wine bottles at once. Featuring a retro interview with Chan as he discusses the complexity of making the movie and how he felt it was a greater physical challenge to play drunk action than sober action, while the Blu-ray sharpens the DVD release to great effect, I still wish that someday we'll be able to see it without the horribly distracting English dubbing and in the format it was initially released back in Hong Kong.